Congratulations to "Taurus", and "Jonetta", the winners in Anne's giveaway. Thank you to all who participated! Every romantic suspense story features an unconventional romance almost by definition—the couple has to fall in love quickly, and under hazardous conditions. So what happens when there’s a sequel, or even a series? The couple can’t fall in love again, so the relationship has to sustain the reader’s interest in some other way. If you are familiar with my books, you know that my favorite plot device is the hidden identity—and in this series, neither Doyle nor Acton are at all what they seem. Although Acton is a well-respected chief inspector, he’s actually a vigilante, manipulating evidence behind the scenes, and making sure the villains don’t get away with murder. Fortunately for the general London population, he loves Doyle, who tries to steer him toward the straight-and-narrow with only mixed results. Although they’re an unconventional pairing, the relationship between the naive Irish rookie and the dangerous aristocrat is every bit as intriguing as the murders they investigate. In Murder in Containment, Detective Sergeant Kathleen Doyle realizes that several apparently unrelated murders are actually “containment” murders—murders to contain an ominous scandal that could reach into the highest levels at the CID. In the process of tracking down the killers, however, she comes to the unsettling realization that Chief Inspector Acton has committed a containment murder or two of his own. 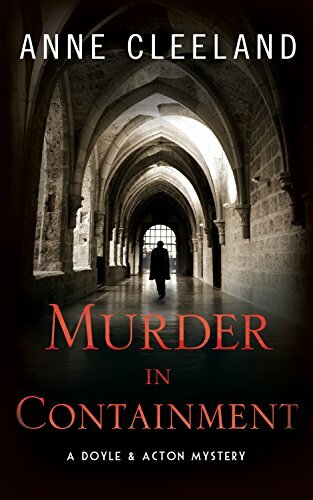 Anne will be giving away two print copies of MURDER IN CONTAINMENT to two lucky readers leaving a comment or email entry. Wow! Talk about your unconventional "heroes" and "heroines." Sounds delicious. Thanks Janice, I hope you like them! I discovered the first three Acton & Doyle books about a year ago, and quickly devoured them. So looking forward to the continuing story! I too enjoy the "hidden identity" concept. Looking forward to reading the latest Acton and Doyle book. Having read all 3 of the previous books in this series and having met you at Left Coast Crime this year, the new book is a must-read! This is such a remarkably fresh and different series with interesting characters. I can't wait to read book 4.